KANCHANPUR, March 9: A 30-year-old Nepali man was killed when the Indian Seema Suraksha Bal (SSB) opened fire Thursday morning following a dispute over a culvert construction amid ongoing tensions at the border near Anandabazar. Police chief of the far western region DIG Romendra Deuja confirmed the death of Govinda Gautam of Punarbaas Municipality- 8 in the incident. “But the SSB man who opened fire is not identified yet,” he said. According to an eyewitness, the thanedaar (SSB local unit chief) had opened fire. “The thanedaar took out his pistol and fired four times. And it was the forth shot that hit Govinda,” said Devendra Khadka, who is from the deceased man's locality. “The bullet hit him in the waist and he collapsed instantly,” Khadka added. He further said that Thanedaar Arbind Kumar Shukla had opened fire after he was hit in the chest by a stone during a scuffle with Nepali protesters. The injured Gautam was rushed to CP Hospital, Dhangadi but he could not be saved. Son of a poor squatter family, Gautam had returned from Saudi Arabia just six months ago after earning a little money. He used to live with his parents, wife and three little daughters. “He was our sole bread winner. We were planning to build a house with the money he brought back from the Gulf,” his widow Sushila said. “We were going to build our house on government land since we do not have any land. Now, we are feeling very helpless,” she added. Disputes over culvert construction are nothing new. There was a pillar on the Nepal side, pillar number 200, which later 'disappered'. Locals had been protesting against 'regular encroachment of Nepali land by India'. According to Hari Lamsal, a local of Punarbas - 8, the spot where Nepal is constructing the culvert is the land that belongs to Nepal only. However, the Indian stance is that the area falls in no man's land. Though Nepal and India have made a study of the issue to address the confusion, there has been no agreement yet. DIG Deuja stated that both sides are still trying to solve the dispute. “Our mutual study team is still making initiatives to solve the issue,” he said. Following the death, locals took to the street and demonstrated against SSB high-handedness. Refuting the statements of victims, eyewitnesses and reporters on the ground, India has denied the involvement of the SSB in opening fire on Nepali nationals near bordering Aanandabazar of Kanchanpur district, Thursday afternoon. A local of Anandabazar in Kanchanpur district, Govinda Gautam sucumbed to injury from the bullet fired by the SSB, while undergoing treatment in Dhangadhi, Kailali. “It is categorically denied that there was any incident of firing by SSB near the border at Aanandabazar, Kanchanpur,” the Indian embassy in Kathmandu said in its official twitter handle. 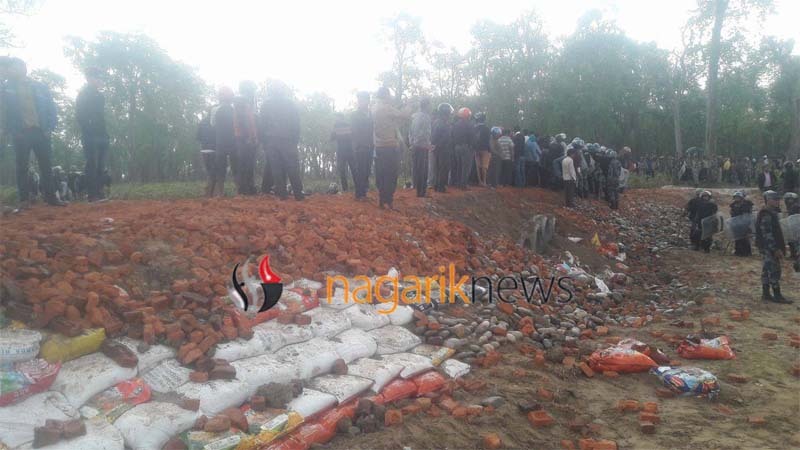 The SSB had tried to disrupt the construction of a culvert by the Nepali side since Wednesday, citing that the culvert was being constructed across no man's land on the Indian side. “There is a need to maintain calm and let the survey officials of both sides discuss the location of border pillars before any construction work is undertaken. District Officials have been directed to cooperate to defuse the situation,” the embassy further tweeted.